Nu Image already made a giant spider movie called SPIDERS just over a decade ago, but we are in the age of reboots and repetition, so it’s only natural they should come out with SPIDER 3-D, in which the crash-landing of a Soviet space station into a New York City subway tunnel sparks a wave of venomous spiders to grow six inches per hour until they reach gigantous proportions. An oddly pale, chunky looking Crista Campbell and Patrick Muldoon are among the health centre workers destined to battle it out with the arachnids on the oddly deserted streets of N.Y.C. 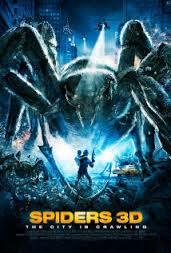 SPIDERS 3-D is admirably deadpan in this age of deliberately silly monster movies, and its 50’s feel, complete with sewer-based (in)action and soapy human stories, has a certain charm – as do all the matte painting shots of New York’s skyline. The second half is quite lively as our heroes are chased around strangely deserted city streets before approximately 10 seconds of about a dozen extras fleeing in panic from a green screen background attempt to fulfil the grandiose promise of the DVD cover. The spider FX are surprisingly impressive at this budget level, and certainly more convincing than Campbell, whose motionless face presumably cost more money to manufacture than the arachnids.